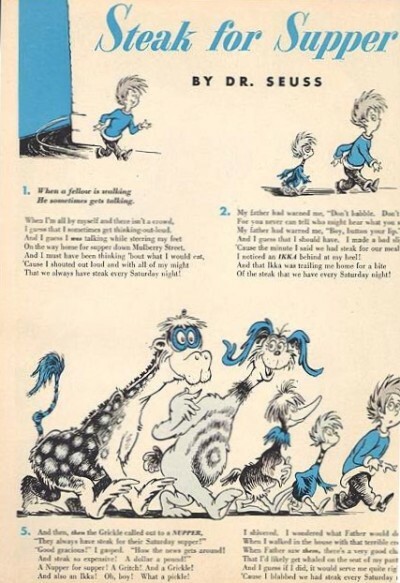 I’ve documented 23 issues of Redbook Magazine from the 1950’s which contain Dr. Seuss stories. Each of these were original stories (except Grinch? ), not reprints like the Seuss stories in Children’s Digest, and therefore likely have collectible value. At this time, these issues are relatively inexpensive to acquire. 21 1 1956 – Feb Did I Ever Tell You? 1. 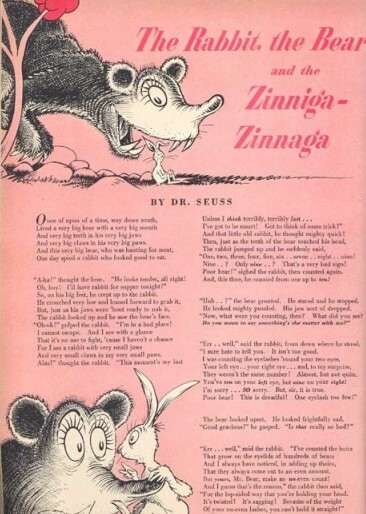 The July 1950 issue with If I Ran The Zoo pre-dates the publication of the book by several months. Notably, the book has text which differs from the original Redbook version. 2. The April 1951 issue with Yertle pre-dates the publication of the book by seven years. Yertle The Turtle (Random, 1958) also includes the Gertrude McFuzz story, which was published in the July 1951 Redbook, and The Big Brag, which was originally published in the December 1950 Redbook. From Ruth MacDonald’s "Dr. Seuss", "At the same time he was working on The Cat In The Hat, Seuss was expected to produce an annual volume for Random House. One year, he found himself with a deadline but no book for the publisher’s Christmas list. The Grinch and his story occurred fortuitously, and the story was written quickly, in a few weeks"
This is contrary to the account in the Morgan’s biography "Dr. Seuss & Mr. Geisel", "In mid-May, Helen wrote Louise Bonino that the Grinch was in the mail, and that she expected it to be the second Dr.Seuss blockbuster of 1957. […] The Grinch appeared in the fall of 1957 and was acclaimed from the start."